Greenstone Retreat is the perfect base for resting, exploring and being in nature. Environmentally friendly products and organic property. The large property is in a quiet location, with lots of gardens to explore and only a few minutes walk to the play ground, local hotel/restaurant and shop. Listen to the abundant bird song, stargaze, practice yoga or head out to explore the local wild West Coast. 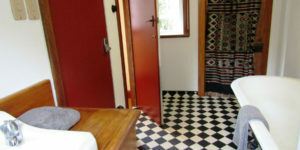 Greenstone Retreat comprises of 3 different accommodation options. VILLA: Historic, Comfortable and Artistic. The Greenstone Retreat historic Villa is perfect for small groups and families with 3 bedrooms. Originally build around 1883, its been recently renovated to create a warm, quirky and loved home which can be your base while you explore the cycle trails, walking tracks and local attractions. The villa is available as a whole home or during winter as individual double/twin rooms . It has large spacious communal areas including a lounge and dining room with a HUGE wood burner fireplace to keep you warm. There is a fully equipped kitchen including an oven and microwave, and with all you need for self catering to help keep your costs down. Free tea, coffee, sugar, oil, herbs and spices. 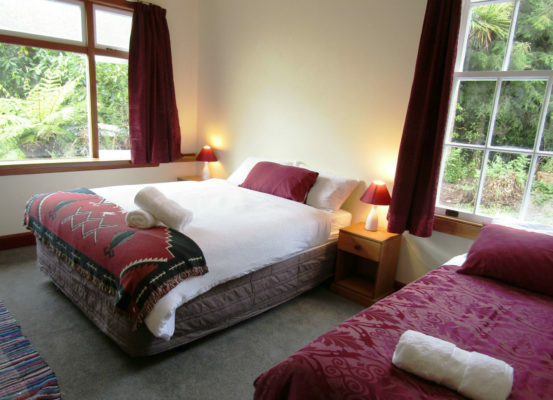 2 large spacious rooms have a queen sized bed and a single bed. The 3rd bedroom is smaller and has a queen sized bed only. All really comfortable to ensure a deep peaceful sleep. Beds are fully made up and fluffy towels provided. There is no TV so you can enjoy each others’ company, and lots of board games, books and free unlimited WIFI for movies. Bathroom includes deep bath and shower. There are 2 further shared bathrooms at the back. At the rear of the villa are two new small peaceful dormitories. 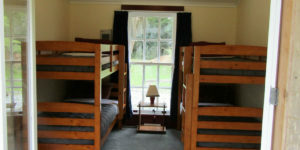 One room has 2 bunk beds sleeping 4, and the other has 2 bunk beds with a double on the bottom sleeping 5. Fully made up with linen, hotwater bottles, blankets and beanbags provided. Free WIFI included. 2 new bathrooms have amazing hot showers and 1 has limited mobility access. There are also large gardens for pitching a tent, or hard spaces for small sleeper vans and cars. Access to the outdoor kitchens, power for phone charging and bathrooms. WIFI and laundry available for a fee. No powered sites or large campervans. The outdoor kitchen is equipped with Free BBQ, 1 gas and 2 electric hobs, fridge, toaster, water kettle, pots, pans, crockery and cutlery for dorms and campers to use. Fresh free range eggs are often available for you to buy here along with Greenstone Retreat preserves and fruit (in season). Free parking plus luggage and bike storage, however please close the gate behind you to keep Scout in. Kumara is a village of approx 300 residents. It boasts a dairy, pub/restaurant, gallery and clothing shop. Low population and very little light pollution gives us abundant bird life and an amazing show of stars after the sunset. Lots of historic information and interesting sites and attractions. Kumara is a small town on a grid system so easy to find your way around. There is no bank, cash machine or supermarket in Kumara. Walking, cycling, mountain biking, kayaking, star gazing, jet boating, fishing, jade hunting, historic sites and information, restaurants and dining and the beach. There is lots water to play in and around with the local lakes, river and beach. A network of tracks for walking, cycling and mountain biking. 20 minutes from Hokitika or Greymouth. 1 hour from Punakaiki and the pancake rocks. 2 hours from Glaciers. . Kumara is a central West Coast location. I live on site in the small house at the back and am available by phone whenever needed. I love to mingle and interact with the guests and I am passionate about recommending things to do in the area and get you off the beaten track. However, if you are a private group I am happy to introduce you to the magic place and leave you to your space. Let me know and I will do my best to make your stay perfect. My Springer Spaniel is called Scout and is very friendly once you greet her. Look for her unique half smile! She is still young though and can be hesitant and bouncy. Please let me know if you are unsure of dogs. You can bring your Pets by arrangement only. It is not fully fenced and dogs need to be supervised or secured. Check in is between 4pm and 8pm. Bookings essential in summer Nov-March.